The Vanity Mirror TV combines an ultra-thin Samsung television cleverly hidden behind a large mirror. When turned on, the TV magically appears through the glass, and when turned off, it vanishes completely. 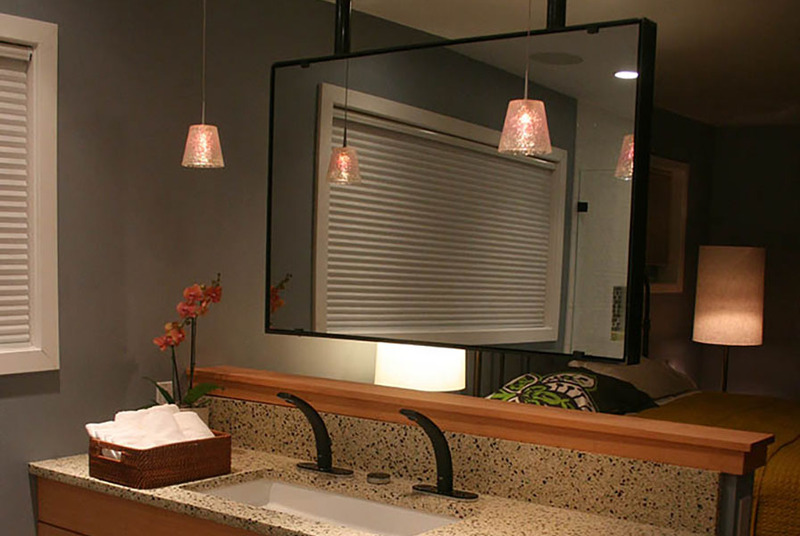 The mirrors are made to the size you specify to fit your bathroom perfectly. 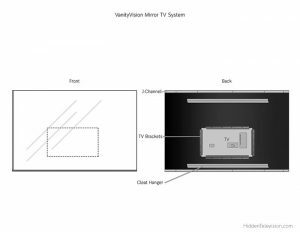 The television is easily hung on the wall with the included mount, so you can unpack and get it setup quickly. 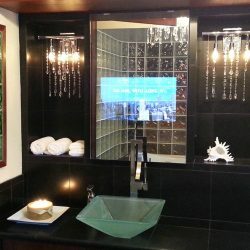 Also included are waterproof remotes, so you can operate the TV from anywhere in your bathroom, including a tub, shower, or Jacuzzi without worrying about getting it wet. The speakers are built into the TV, so there’s no need to add external speakers. 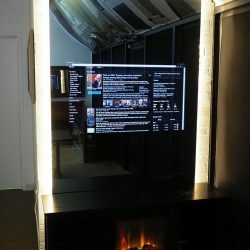 Samsung apps are built into the televisions, providing Netflix, YouTube, Hulu, Spotify, Google Video, and many other popular channels and services. We also offer the VanityVision mirror by itself for DIY projects. Michael Strahan was excited to receive his new Hidden Television! He had been stuck with Kelly Ripa’s old dressing room, complete with flowers, scented candles and throw pillows. The Man Caves hosts Tony and Jason transformed it into a manly space. Loaded with a Vanity Mirror TV, closet organizer and one remote to control the entire room, Michael ends up with a dressing room fit for a Super Bowl champion. When Grandpa moves in and has to share the throne with 6-year-old twins, the chaos is too much for Mom to take. Hoxie and Dave take on the near impossible task of creating a bathroom that will please three generations of this family. 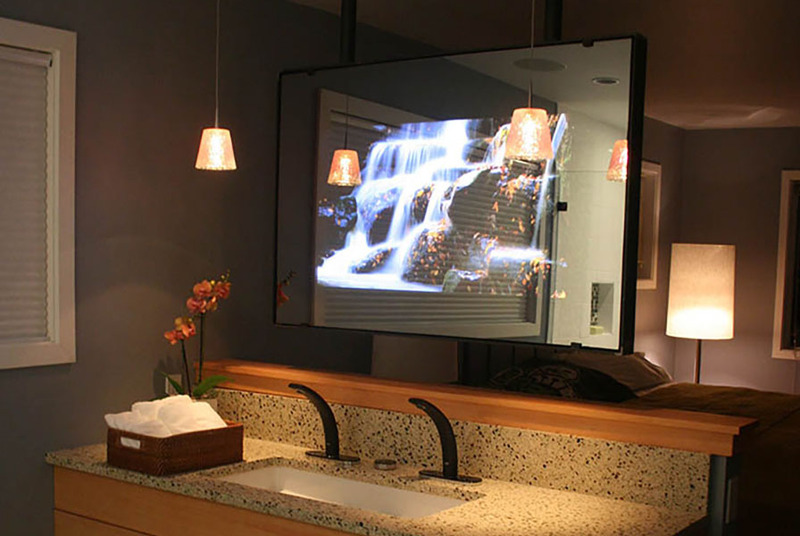 Featuring an ultra high-tech Vanity Mirror TV, hidden until the remote clicks on! A successful hedge fund manager retired in Colorado wants to transform his bathroom with the “greatest crapper that’s ever been conceived!” His wife is excited she can watch TV from the tub, and her husband is just plain excited. Jeff and Dave have some concerns about taking on a client who’s a design expert, but get really worried after hearing her husband’s ideas for the master bathroom. Michael Symon is an Iron Chef and has hosted numerous Food Network shows. For his very own man cave, Michael wants a gym where he can stay in shape while watching the Food Network, training for the grueling hours he works in his restaurant. Tony and Jason better be able to stand the heat in the kitchen so they can give this chef a recipe for fitness. 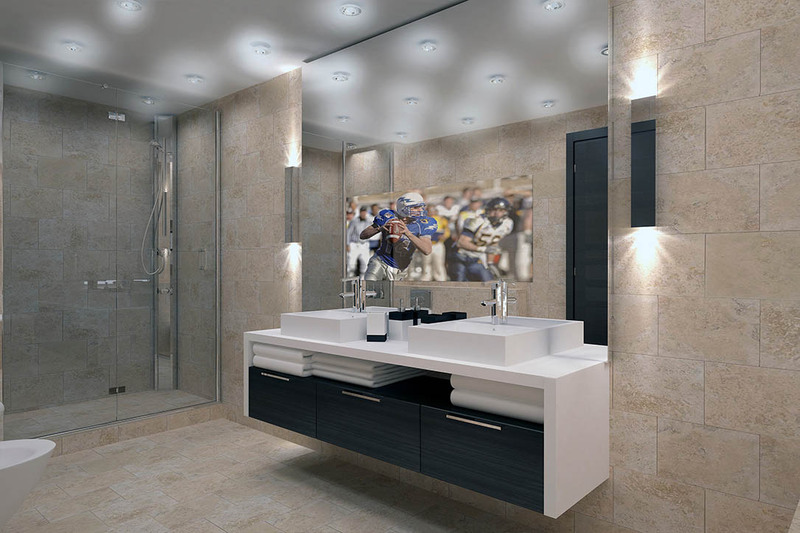 A builder grade bathroom becomes a bachelor’s dream with the ultimate indoor/outdoor shower connected by an eight-foot bi-folding glass door. Concrete floors give it a modern industrial feel, a full bar with a mini fridge adds storage and the massive mirror turns into a big screen TV at the push of a button. The showpiece is the vanity though, a vintage motorcycle that is refinished and plumbed to hold two transparent blue sinks and glass countertops. Matt and his crew are crashing Seattle, with plans to customize one homeowner’s master bath with a combination of hi-tech gadgets and eco-friendly materials. Cork floors, recycled tile and reclaimed wood bring in the “green” elements of Seattle style, and a large window brings in the amazing view of the water. 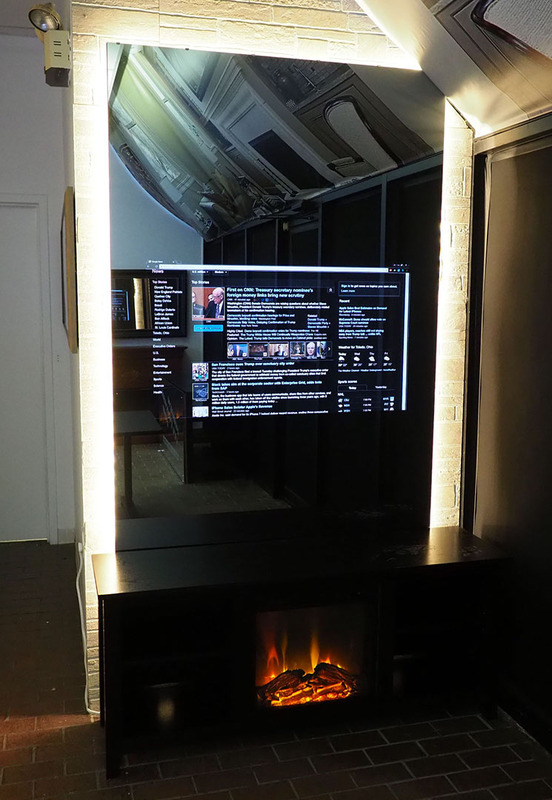 And for the software-engineer homeowner, the room is tricked out with digital faucets, motorized doors and a 40″ TV hidden in the mirror. Do I have to be a celebrity to order one? While many of our clients happen to be celebrities, our clientele also includes businesses, interior designers, and homeowners with excellent taste. 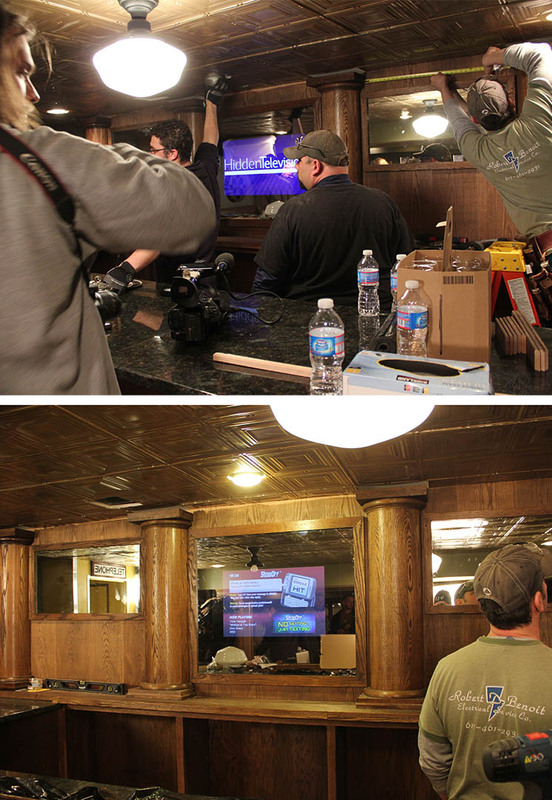 It only takes us 2 weeks to build a custom size vanity TV to your exact specifications. Can I order it frameless? By default, the mirrors are frameless with flat polished edges. You can add a frame of your choice with the pricing and ordering calculator. Can I recess the TV? 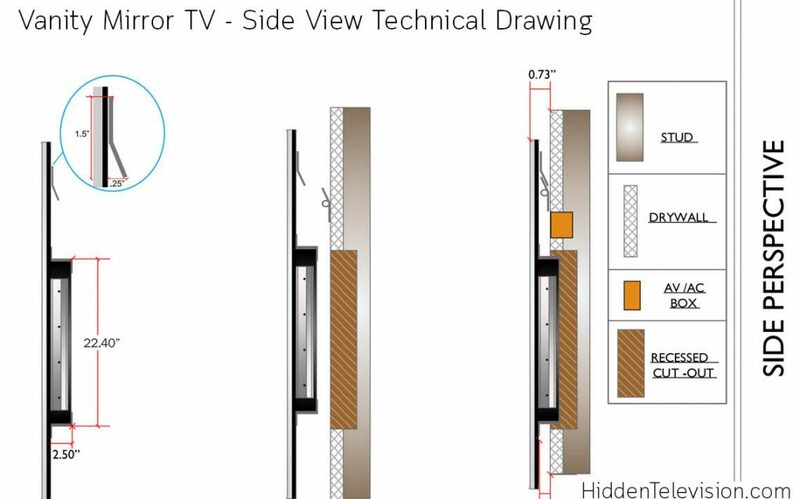 Yes, you can recess the TV into the wall for the mirror to sit flush to your wall. How good is the sound quality? 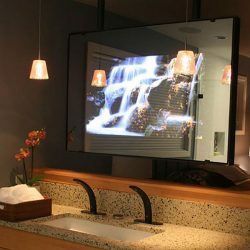 The mirror doesn’t block the sound, so you get the same high quality sound you’d get from any other flat screen TV. Many clients supplement the TV sound with additional ceiling recessed speakers around the room, to allow listening in the shower or spa. We combine the brightest Samsung televisions with the most transparent vanity mirror available to deliver unmatched picture clarity. Do I need to use a special wall mount? 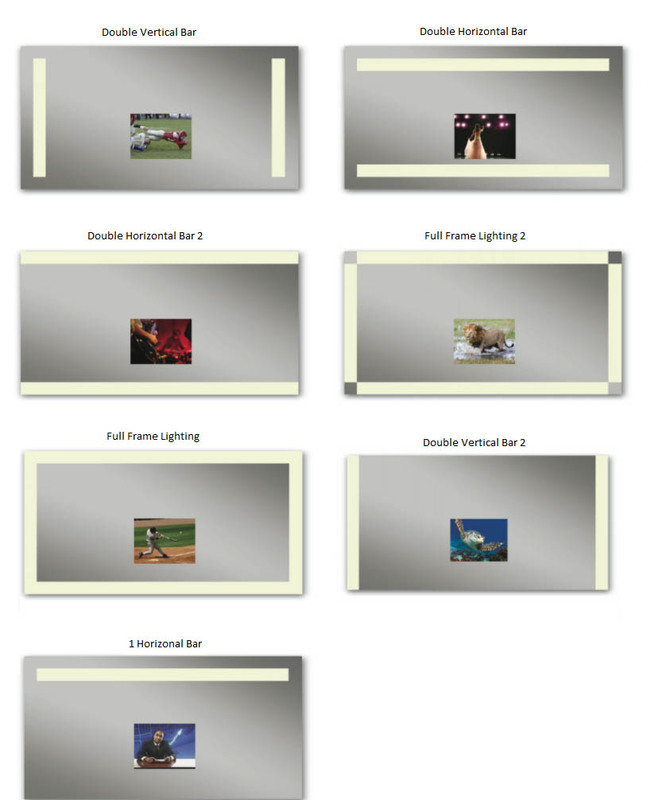 We offer on-wall and flush mount installation options. Please feel free to specify which installation you prefer when ordering. How do I hide the cables? For a seamless installation, your installer or electrician can string the cables back through the wall to hide them. What other frame options do you have? 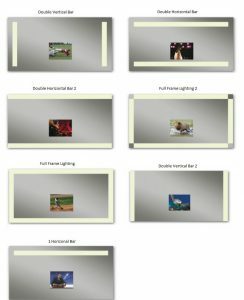 We’re able to customize the frame to exactly what you want. 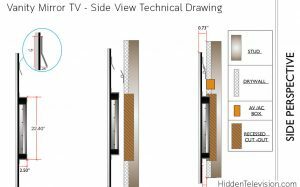 Browse additional frame options at Larson Juhl and Framerica, then get in touch with us to build your perfect TV. What is the advantage of buying the complete system instead of just the glass? 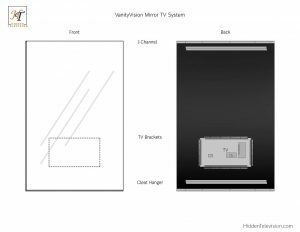 The main advantage is that you receive a ready-to-install TV, crafted to perfection by our experienced team of artisans and engineers. 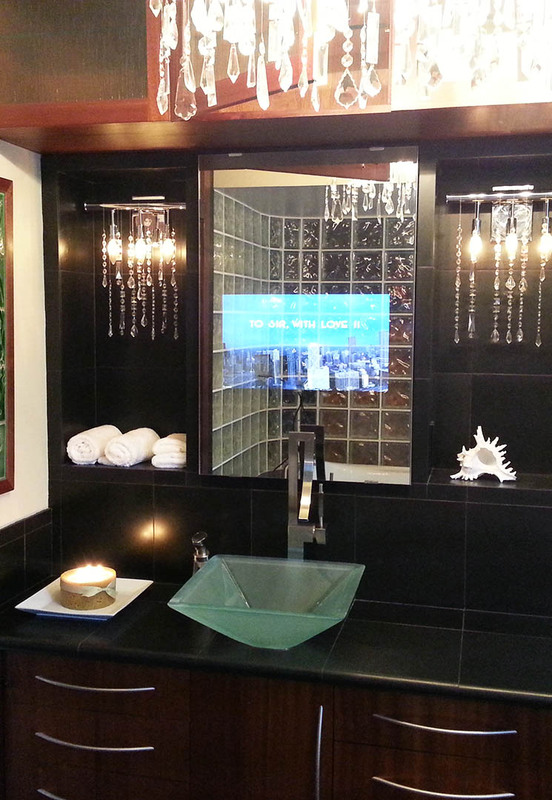 Our Samsung Mirror TV systems are as easy to install as any regular TV and are beautiful pieces of functional art. 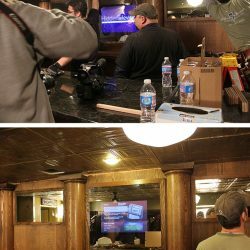 A custom project where you just buy our glass will require hiring a woodworker or cabinetmaker to frame it up, which can be expensive, require more work on your part, and often takes more time before your mirror TV is ready for use.